A woodworking and building trade concerned with the heavier aspects of construction with wood. Framing and joining timbers in a structure. 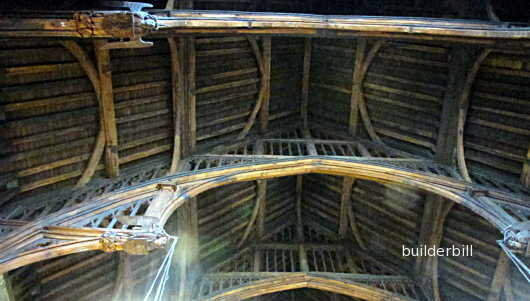 The hammer beam roof to the great hall in Westminster. London UK . With a span of 68 ft. and a length 238 ft. this is truly a roof that does justice to the hall that it covers. The corbels are 22 ft. above the floor and the ridge is 90 ft. 6 inches above the floor. Above is an example of the carpenters art and skill. Built by master carpenter Hugh Herland for Richard the third of England around 1395. The modern journeyman carpenter may have to own dozens of power tools to remain competetive. He has a wide range of materials to work with rather than just timber alone. Formwork is a branch of specialised carpentry but most carpenters have a working knowledge of it. The carpenter is often involved with the setting out of the plot of land before the actual work begins. The profiles for the excavations are mostly done by carpenters. In some cases he may be involved in shoring the excavatioons or he may be fixing forwork for the footings. It is certainly carpenters that form concrete slabs or lay floors joists. Wall framing is still made and fixed by carpenters and now that steel wall framing is beeing used then the carpenter's skills are used to fix. them. Roofing has changed an awful lot in the last 50 years but still the main guys that fix the bulk of the roof roof structures are carpenters. 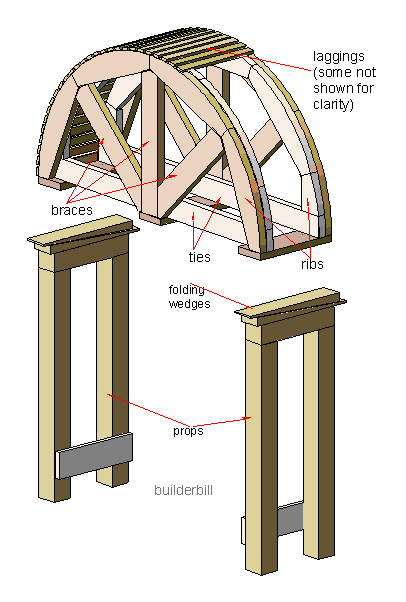 Carpenters in general have a broader knowlege of building construction than just about any other building tradesman. Masons, blocklayers and bricklayers build a lot of walls but most times when they get a job out of the ordinary they call on the carpenter to help them out. Formwork is the main example of the tempory work that carpenters do and centering, propping, shoring, temporary bracing some types of scaffolding are some of the others. The work is nescessary for the construction but not seen in the end result. 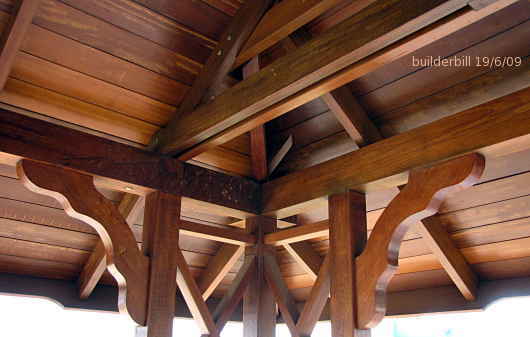 Above is a detail of a modern pergola or deck roof built to the age old designs used in Java, Indonesia. Practical carpentry with a touch of flair.